Jimmy Graham's grievance hearing is expected to conclude today; the Saints star is seeking to be labeled as a wide receiver instead of a tight end for franchise tag purposes. According to Ian Rapoport, one of the NFL's arguments is that Graham lists himself as a tight end in his Twitter bio. 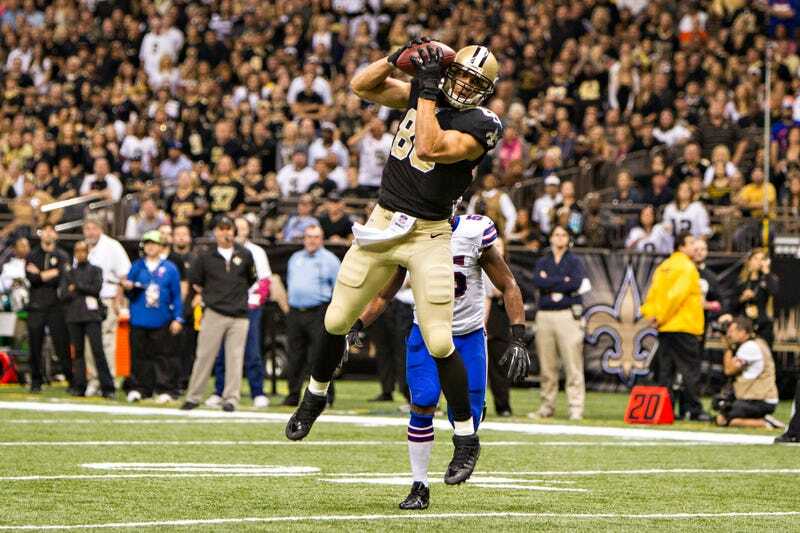 In 2013, Jimmy Graham was 13th in the league in receptions (86), 15th in yards (1,215), and first in receiving TDs (16). According to Pro Football Focus, he pass blocked on 4.9 percent of his snaps, good for 44th out of 50 qualified tight ends. As we wrote earlier this year, this seemingly semantic argument could cost the elite football-catcher $5.3 million, the difference between the salary of a franchise-tagged wide receiver ($12.3 million) and a tagged tight end ($7.0 million). Is Jimmy Graham A Tight End? It&apos;ll Cost Him $5.3 Million.